John R.W. Stott, author of the classic introduction to the Christian faith, Basic Christianity. I fondly remember listening to John Robert Walmsley Stott teaching tapes in college some thirty years ago. Stott was a staple speaker at InterVarsity Christian Fellowship conferences in the last third of the 20th century. Verse by verse, Stott would calmly expound each point in the biblical text. He was not flashy, but in his eloquent British voice he was passionate about gaining an in-depth perspective on God’s Word. Stott died a few years ago at age 90, on July 27, 2011. John Stott still embodies biblical wisdom for me. He was scholarly but still had a pastor’s heart that enabled him to care for people. How do the great truths of the Bible impact not only the way I am to think, but the way I am to live as a Christian? In the dozens of books and biblical commentaries Stott authored, he tackled tough issues with day-to-day applications in a tender and very practical way. 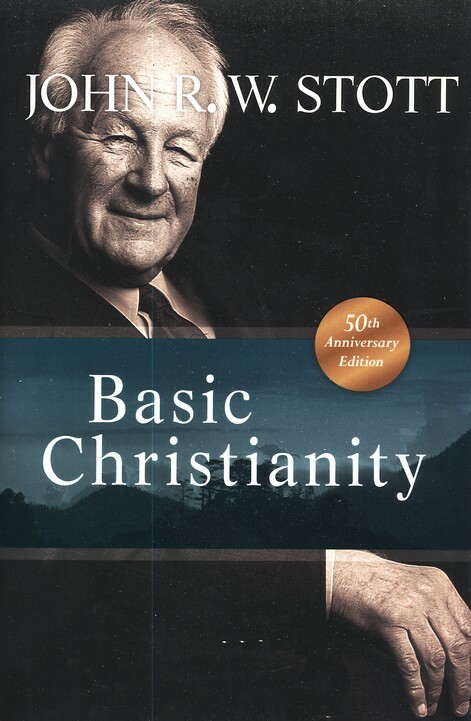 In celebration of Stott’s contribution to the church, Christian Audio is offering a FREE audio download of Stott’s classic book, Basic Christianity, during the month of August, 2013. Looking back over various spiritual detours that I have made since my years in college, I probably would have avoided some pitfalls if I had paid closer attention to the wisdom and consistent example of John Stott. In an age where many Christian singles are delaying getting married, it really helps to know that Stott, who never married, remained celibate and faithful his entire life. During the excesses of charismatic spirituality and television evangelist scandals over the years, Stott maintained an openness to the work of the Holy Spirit, but he cautiously sought to ground it in the sober integrity of biblical teaching. When Christians had been prone to ignore the plight, poverty, and sufferings of others, Stott reminded believers of the Gospel’s call for social justice combined with an evangelistic heart for the lost. As the chief architect behind the Lausanne Covenant, Stott, along with Billy Graham, acted as the primary statesman and visionary for the biblical mission of the church for global evangelization, transcending denominational and political lines: “The Whole Church taking the Whole Gospel to the Whole World“. Though a popular preacher, as a leader Stott resisted the “cult of personality” tendencies sometimes thrust upon him. Though clearly the most recognizable person at All Souls Church in London, where he pastored most of his life, Stott believed in shared leadership, sharing the pulpit with other younger staff. Stott’s favorite activity was birdwatching. According to Stott, the birds have much to teach us about God, if we would only shut up our mouths and listen to them. I find some marvelous wisdom here. As a young believer in the 1940s, he signed up as a conscientious objector and refused to fight in World War 2. Later on, however, he did change his mind on pacifism as he continued in his study of the Bible. In the 1960s, he publicly went up against fellow British evangelical preacher, Martyn Lloyd-Jones, in a dispute over whether or not Christians should remain in denominations and churches that did not strictly adhere to doctrinal purity. While Lloyd-Jones urged evangelicals to separate from these “mixed” church associations, Stott argued that Scripture emphatically urges us to be a witness, even in churches where not everyone has complete agreement with us. For Stott, there is no perfect church, and any Christian who goes “church hopping”, looking for that “right” church and never putting any roots down is severely misguided. Though he never fully repudiated the belief in everlasting conscious torment in hell, Stott’s study of Scripture towards his latter years led him, to the amazement of other Christian thinkers, at least to a tentative conclusion that the wicked would be ultimately annihilated in hell, as opposed to being forever “tortured”. John R. W. Stott may not be agreeable to everyone in every respect, but several things should stand clear. He loved God, he loved God’s Word, he loved the mission of the church to reach the lost, and he loved to teach the truths of the Bible in ways that you could apply on an everyday basis. That is a model for wisdom. *** Quick little note: eChristian.com is offering the eBook version of Basic Christianity for $1.99 through the end of August, 2013. This entry was posted on Sunday, August 11th, 2013 at 2:24 pm	and tagged with Basic Christianity, Christianity, John Stott, Lausanne Covenant, veracity and posted in Witnesses. You can follow any responses to this entry through the RSS 2.0 feed. I downloaded the audiobook, which was free, and am enjoying it. I see what you mean about his style–I really like how he lays out his arguments cogently, carefully citing Scripture. Thanks again for opening up another inspiring resource. Gotta love a good audio book. What a fabulous summary of the Christian faith! Stott is a very good apologist–I heard many points I hadn’t heard before. His coordinated and well-founded use of Scripture verses is refreshing. Thanks again for sharing this convicting resource!